Did you read the big news on Wednesday? No, not the by-election thing. No, not the eight Bangladeshis detained under the Internal Security Act (ISA). Though Seth Rogen has a beard too and probably should be held under ISA if he ever returns to Singapore. 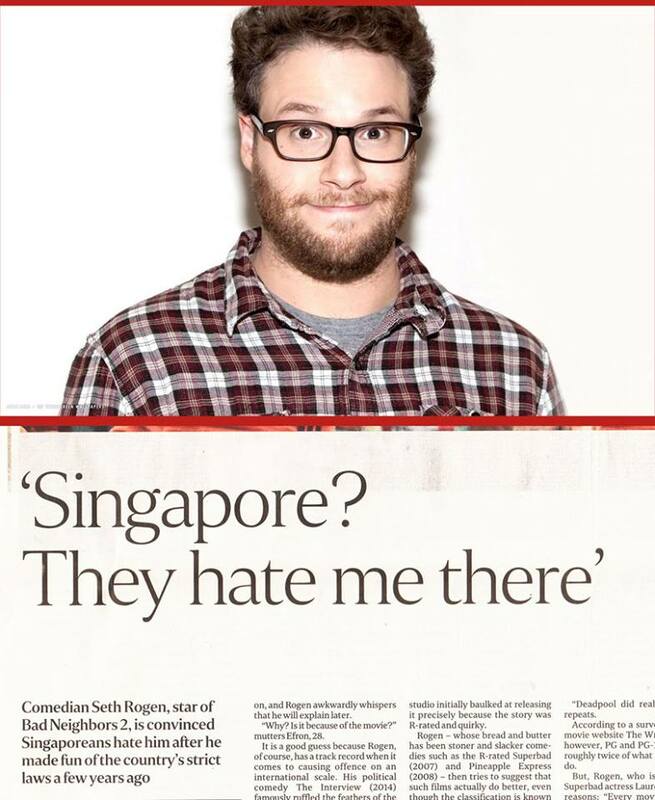 I’m talking about The Straits Times report that Rogen believes Singaporeans hate him. But why does Rogen think Singaporeans hate him? All The Straits Times said was: “He is referring to the backlash following his comments about a trip to the island while promoting his superhero flick Green Hornet in 2011. What were these remarks, pray tell? The Straits Times didn’t say. Many of you probably don’t remember. It was five years ago. So as a public service for my fellow Singaporeans (and for the benefit of Rogen’s blur Bad Neighbours co-star Zac Efron), let me recap specifically what Rogen said so that you can hate him as he is already convinced you do. The offending remarks were made on the Conan O’Brien talk show on March 10, 2011. Rogen was there to promote the movie Paul, where he plays a weed-smoking alien. So he pretty much plays himself. But the interview started with them talking about the Green Hornet movie, which was released two months earlier. O’Brien kicked things off by pointing out how stars like Rogen have to promote their movies internationally. Actually, it was in 1994 when Michael Fay was sentenced to four months in jail and six strokes of the cane (later reduced to four strokes) for not just vandalism, but stealing road signs as well. Should we hate Rogen just for getting the year wrong? He then went from caning to cannabis. But that’s not even the most frightening thing. Okay, a few factual errors there. You literally can chew gum in Singapore. Mouths are allowed. Chewing has not been outlawed. Ironically, the “weird story” about the subway is true, though. Yes, there was a time when train service was delayed due not to track fault but gum fault. Those were the days. O’Brien then asked Rogen if he talked to the people there, meaning us. Then he went on to talk about what he did in Beijing. Do you hate him already? The way Rogen was badmouthing Singapore abroad, he might as well be running for election in Bukit Batok unsuccessfully. Wow, looks like if Rogen ever comes back, he might be better off being detained under ISA. Still, it could’ve been worse for Rogen, who later in 2014 made The Interview, a movie where North Korean leader Kim Jong Un’s head is blown up in painstaking CGI detail. Who are these people? Seth Rogen, Conan O’Brien? Do they even know where we are, let alone what we are? They do not know us, yet they seem to believe the worst of us. It reminds me of when a major energy company in the US sent me a letter once, and at the end of the address was “Singapore, People’s Republic of China”. Seriously? I do believe the US still has a long way to go in understanding other countries. Does Rogen know that because of our strict laws, which are in fact enforced, the streets are actually safe to walk, even for women at 2am or 4am? Not a drug peddler in sight, let alone someone trying to rob you of your Rolex. This is what separates Singapore from the rest of the world. When someone does try to flout the law and flaunt his right to do what he wants, like steal road signs or car number plates, the full force of the law will be brought to bear. But of course, fairly, with the accused’s day in court, where he can defend himself against the charges brought against him. And I still remember actress Jessica Chastain not being able to pronounce the word “durian” right. She actually enjoys the fruit, or at least that is what she told the Singapore press. But once back home, and on the Jimmy Kimmel talk show, she berated it, agreeing with her host’s disgust for the fruit. I am not sure how much good that did in promoting Asia’s king of fruits in the West, when the poor fruit did not even get a chance to explain itself. I believe it is important to understand and show respect at all times. That is the only way one can establish a rapport with the world, and this does not apply only to politicians, but even more so to high-profile entertainers. Their fame and fortune demands that they be responsible and get their facts right.